ATTENTION: This image is not in the public domain. Please read the sections on Permission and Licensing below, use it correctly with attribution, and do not copy illegally. 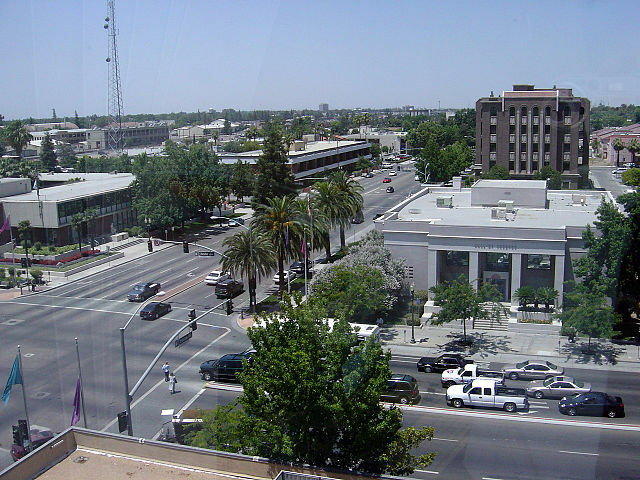 English: Bakersfield, California, USA. City Hall and Police Headquarters at left and Hall of Records at right. Ffynhonnell Transferred from en.wikipedia; transferred to Commons by User:Переход Артур using CommonsHelper. Photo taken by Bobak Ha'Eri, on June 16, 2003. Please observe license and properly cite in use outside Wikipedia. If you have any questions about the licensing, please feel free to use the contact information at my user page.